For openers, I set the probability of the confab of Congressional leaders coming up with a compromise that Trump can sign at near zero.. I expect a package that includes amnesty for all and no meaningful border security (i.e. walls) — except where it they’re already in place (think: California). There is a slim chance that they come up with a DACA – Wall package, but I doubt that’ll happen. So, what if Trump doesn’t get wall funding? He’ll be right back where he was last Friday. He can close 1/4th of the government again. But, that didn’t seem to work this time and the pain point finally became evident … get air controllers to call in sick. Note: most polls continued to show that 60% of people didn’t think they were impacted by the shutdown (I’m in that group), 20% felt some minor impact, and 10% were experiencing serious issues. 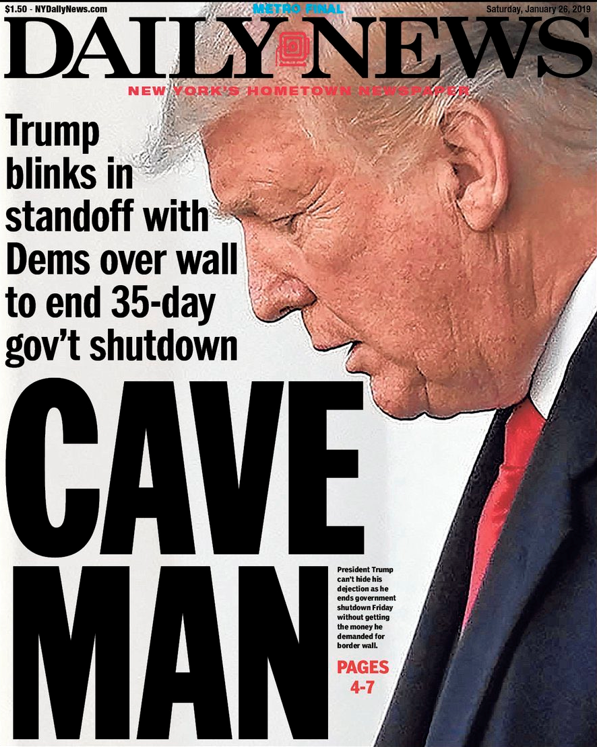 That leaves him with only one option: declare an emergency and build the wall with funds siphoned from other government budgets. That’s what I expect he’ll do. I’m unswayed by arguments that he’d be setting a precedent that the Dems will use someday to enforce one of their mega-priorities. Get serious. The Dems don’t need a precedent. They’ll eventually declare a climate change emergency whether Trump calls a border emergency or not. Take that to the bank. It’s not “if”, it’s “when” … and totally separate from what Trump does now. The only thing, for sure, is that things are going to get even uglier. Pelosi promised a State of the Union when the government was re-opened. That won’t happen in the next 3 weeks. She’ll won’t let Trump present an hour long sales pitch for the wall to the American public — supported by Angel Moms and border guards in the audience. Sure, the emergency declaration will be adjoined by the 9th circuit, but an appeal will be fast-tracked to the Supreme Court. I think the odds are better than 50-50 that the SCOTUS will side with Trump. After all, the move would be constitutional … and Gorsuch and Kavanaugh will be casting votes. Plus, timing should be about right … another mass caravan is scheduled to approach the border about then. Do you think the SCOTUS wants to own the caravan’s behavior and outcomes? I don’t. This entry was posted on January 28, 2019 at 7:15 am and is filed under Government shutdown, Trump, President Donald J..	You can follow any responses to this entry through the RSS 2.0 feed. You can leave a response, or trackback from your own site.